Hello everyone! 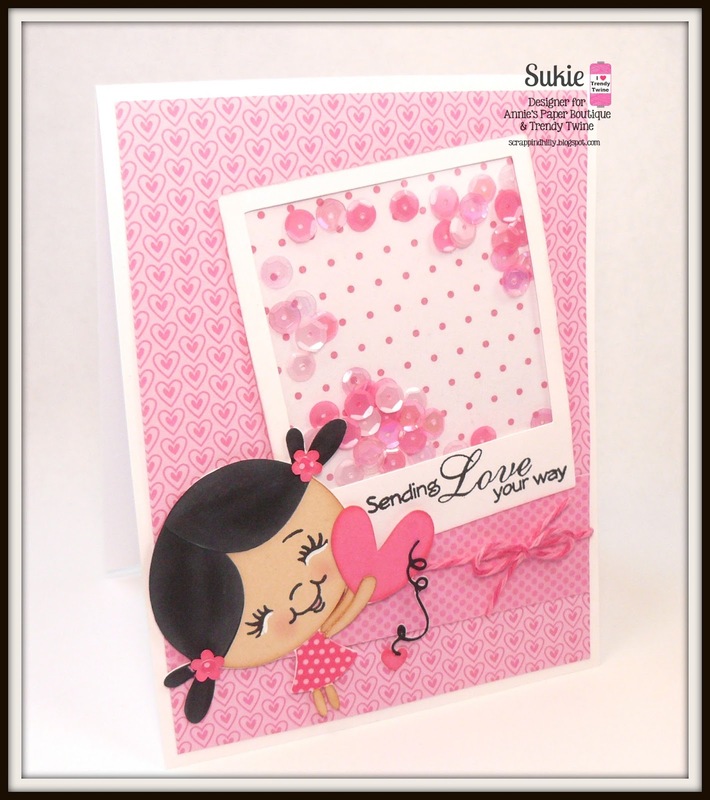 This is Sukie with a card to share featuring Raspberry Cupcake twine and the Raspberry Cupcake sequins. I created a shaker style card using a Polaroid frame cut from the When I was a Kid cartridge. The shaker was created with the We R Memory Keepers Photo Sleep Fuse Tool. I just got my new tool for Christmas and already love it. The adorable little girl was cut from the KaDoodle Bug Designs Sweet Love cutting file. I stamped her face with the Peachy Keen In the Garden Assortment stamp set. 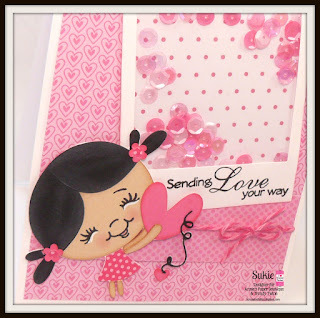 The sentiment is from the Scrappy Moms With All My Heart stamp set. I used a bit of the Raspberry Cupcake twine to accent my card as the finishing touch. Head on over to Annie's Paper Boutique to check out all of the gorgeous twine colors and to purchase these Raspberry Cupcake sequins. Thanks so much for stopping by and have a fabulous day! I know I have said this before but shaker cards are so fun to make and people love getting an interactive card! Totally LOVING that the sequins are matching the twine colors as well!!! Here is a close up of the shaker part. I did add some pink and white seed beads to my sequin mix for some extra bulk in my heart. It's a great way to fill up your shaker without using a ton of sequins...in my case because I LOVE to hoard them...LOL! Hello all! I'm Helen from HTB Creations. Today, I made a quick decorated small water bottle using Raspberry Cupcake Trendy Twine and the fun Happy Valentine's Day Printable from Annie's Paper Boutique. I was having trouble picking a pink paper to wrap the bottle in so I just went with white. It was a bit plain though, so I glued my Raspberry Cupcake twine around the bottom of the wrap and then cut out and pop dotted two of the round hearts from the same printable sheet on the sides. I was able to use a circle punch on these (remember, I can't cut straight and definitely not in a circle!) and only lost a tiny bit of the pink outer circle that was printed. 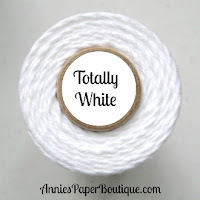 It's Tammy, and I am happy to share with you a little gift I put together for my son to give to his teachers that incorporates some Raspberry Cupcake Trendy Twine. I love decorating and gift giving anything in a jar. They are so fun and easy to decorate. I spray painted the top and set to dry. Once dry, I then hit it with some spray adhesive and added some chunky glitter. This gives a slightly better view of the top. I just die-cut a circle from hot-pink patterned paper and die-cut a lighter pink heart to cover the jar seal. At the top of the jar, I added some light pink crochet lace trim which I topped with the yummy Raspberry Cupcake Trendy Twine tying in a bow embellishing with a baby pink paper rose. I simply adhered a die-cut layer to the center of my jar with my stamped images and sentiment. Before I adhered the layers, I trimmed my circle with Raspberry Cupcake Trendy Twine adding a bow to the top for a further embellishing touch. Hello! Happy new year! 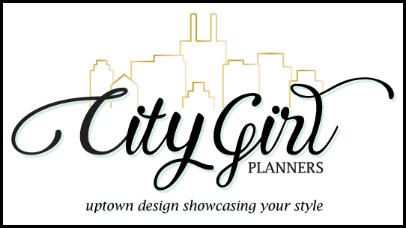 Welcome to the first Planner Friday of 2016, I am Amanda from She's Eclectic and I'm the planner gal here on the Trendy Twine blog. 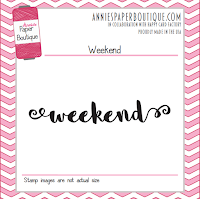 I have been using planner stamps and lots of other goodies from Annie's Paper Boutique for nearly two years now and they have really helped me stay organised and be a little creative too. I know that I would get myself into a muddle if I didn't use a diary of some kind and as I check mine regularly I like to have some fun decorating my pages and inject some colour into my days! I find January quite a hard month to get through, I get so excited for Christmas in December and then wet, grey January rears it's head and spoils everything! I have been using a lot of pink in my planner to cheer myself up and to be honest I am still drinking festive coffees to keep a little Christmas happiness alive inside me... gingerbread latte anyone? Peppermint hot chocolate? So inspired by my caffeine addiction I decided to use the Need Coffee! 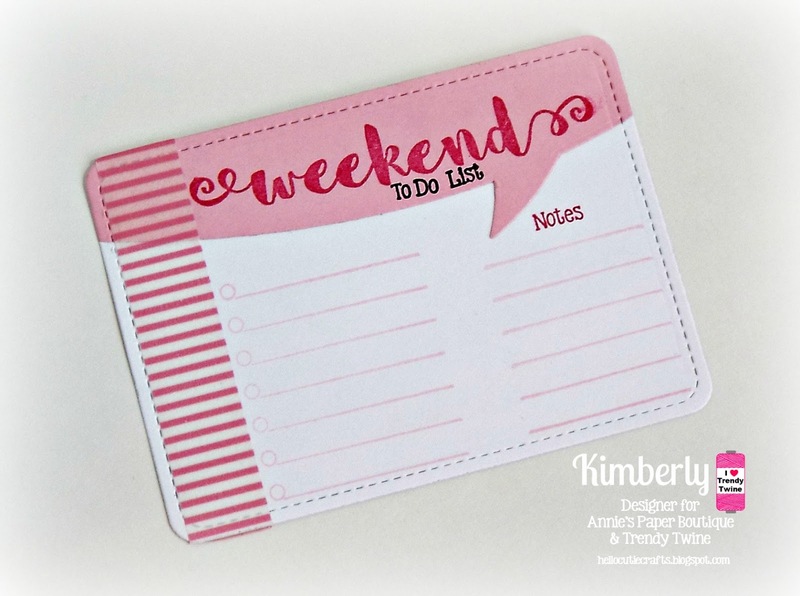 Planner Stamp Set to decorate my pages this week. The set includes five super cute coffee style illustrations and then a collection of different coffee quotes and hashtags to make you smile or give you a giggle. The stamps in this set are smaller than the ones in the Drinks & More set I have used before so they don't take up much room. 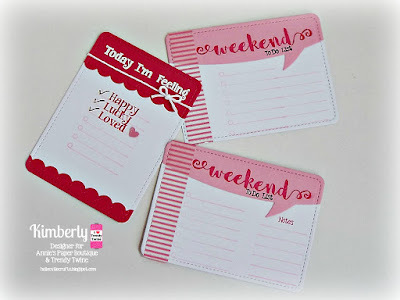 They fit easily inside the Erin Condren and Happy Planner boxes as well as on my Filofax pages, I think they are perfect for most types of planners. Did you get a new planner for Christmas or have you decided to get organised this year? If you feel inspired to try your had at decorating your pages or giving planner stamps a go why not check out the store and see if anything takes your fancy? I hope to see you again in February! 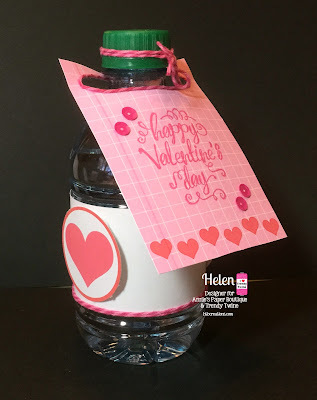 It's Millie, from Crafting with Creative M, and today I have for you a Valentine's Day project that I made with the pretty Raspberry Cupcake Trendy Twine. 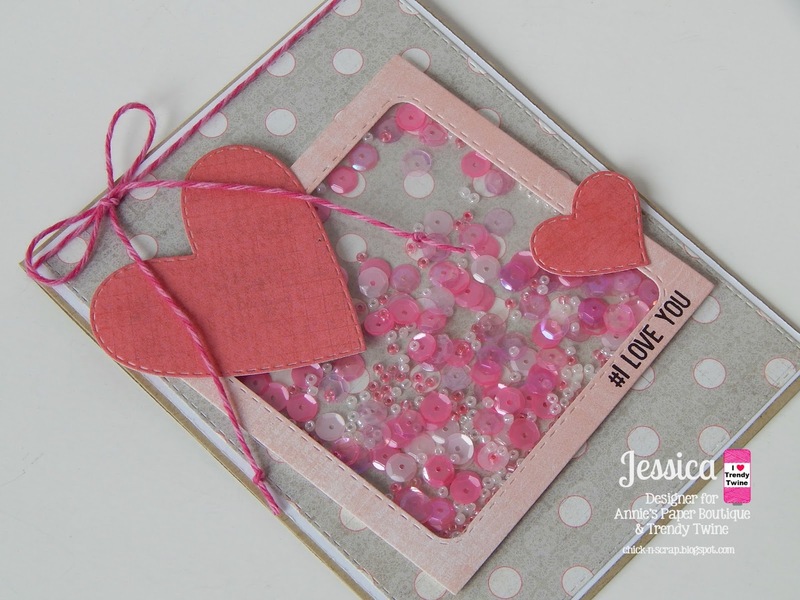 Here is what I created.....Valentine's Day Tags!!! 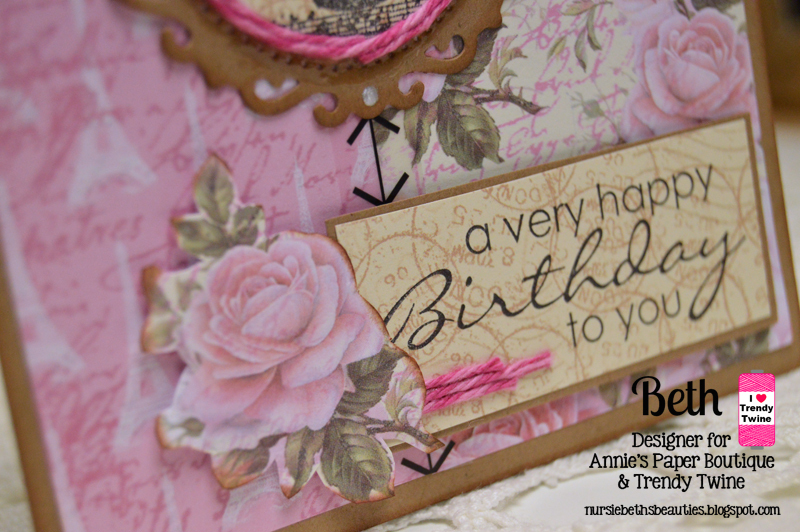 I used pink & red card stock for the base of my tags and a scallop border punch. I used the images from the new Valentine's Day Printable from Annie's Paper Boutique. For some dimension I used foam dots on certain images. I wrapped the Raspberry Cupcake twine around each tag. I placed a Pink Striped Polka Dots-Trendy Page Dots and pink pearls to the center of each pretty Raspberry Cupcake Twine bow. used a hot glue to adhere a mini clothespin to the back of each tag. Once my tags were completed I clipped them to the back of a Biggie Glassine Bag. I will fill the bags with Hershey's Kisses. 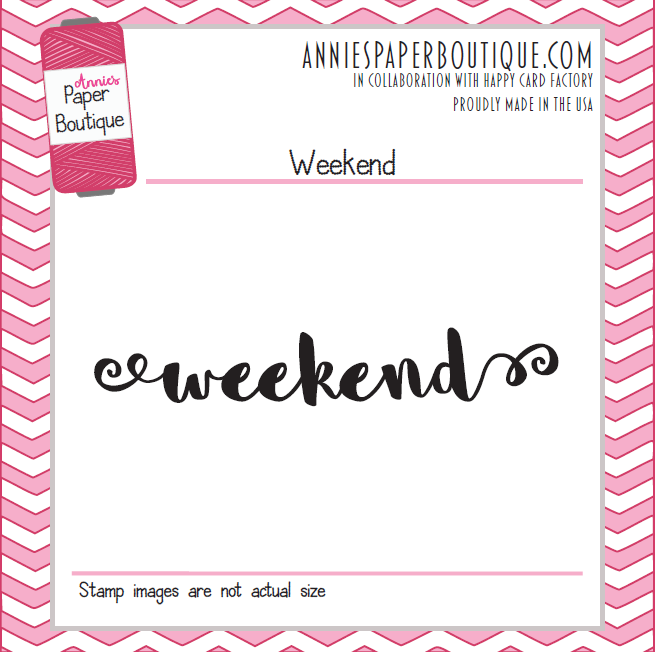 I am sharing some DIY Pocket Scrapbooking (Project Life style) cards using several of Annie's Paper Boutique Planner stamps. I made three cards, two of the "Weekend" one because I thought it would also work perfectly in my MAMBI Happy planner. I took the Stitched Journal die (Lawn Fawn) and for my cards but first I added the borders, using the Speech bubble border die (Lawn Fawn) and the Stitched Borders 1 die (Pretty Pink Posh), then I added some stamping to each card using the stamp sets. I heat embossed the "Today I'm Feeling" with white embossing powder to make it pop on the Melon Mambo cardstock. 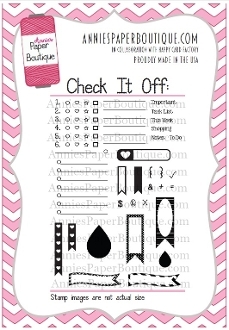 I used the Check It Off set for the lines, 'To Do List' and Notes. Then added some Totally White Trendy Twine with a bow for a little decoration and a strip of washi tape on the other cards. I think these will be perfect to journal on or just as filler cards and to punch and add to a planner. This is Shelly from My Paper Love sharing a fun Valentine treat showcasing our Twine of the month Raspberry Cupcake Trendy Twine. 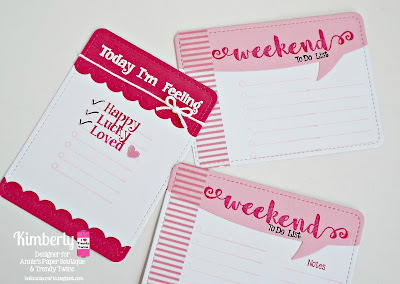 I just LOVE all the pink themed projects this month. If you love pink make sure you come by everyday we've got lots more for you! I just love the Clear Take Out Boxes from the Boutique so I decided to fill one with some pretty candy and make a Valentine treat box. 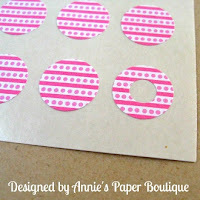 For the tag I used a Tag die cut and bold black and white stripes. For the light bulb I cut two pieces and used a heart die cut to cut a heart in one of the pieces. I added some of the Raspberry Cupcake Trendy Twine to the heart and then adhered the other piece to the back. I added some yellow ink and a Raspberry Cupcake Trendy Twine bow to my bulb and it was complete. Before I attached it to the tag I stamped a sentiment to match my theme and attached the tag to the Clear Take Out Box. Stop by the Boutique and grab these goodies to make your own treats! Good morning crafty friends! 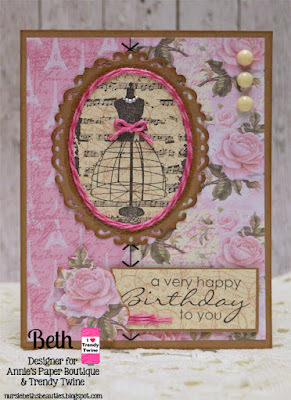 Beth from Beth's Beauties here, and today I am sharing a card that showcases the beautiful Raspberry Cupcake Trendy Twine. The paper I used is called Letters From Paris by Wild Rose Studio. 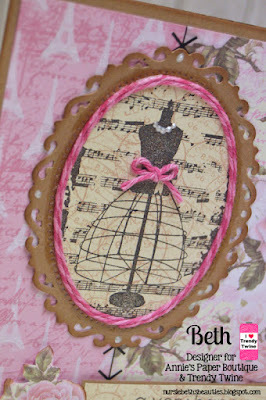 I used the dress form stamp from Unity and the sentiment stamp is from Whimsy Stamps. I used a spellbinders die to create the decorative oval behind the dress form and then wrapped Raspberry Cupcake Trendy Twine around the stamped image. A bow of twine to the waist of the dress was the perfect addition. 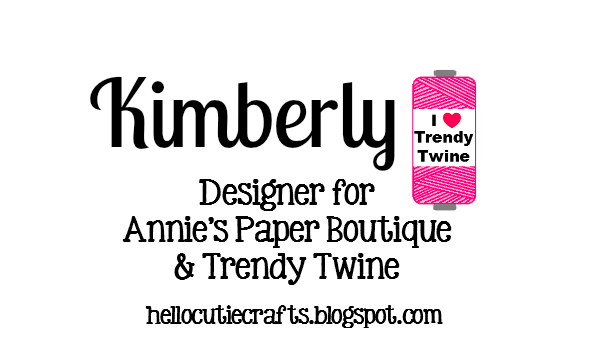 By the sentiment, I thought it could use a little more color, so I added 3 lengths of Raspberry Cupcake Trendy Twine for visual interest. 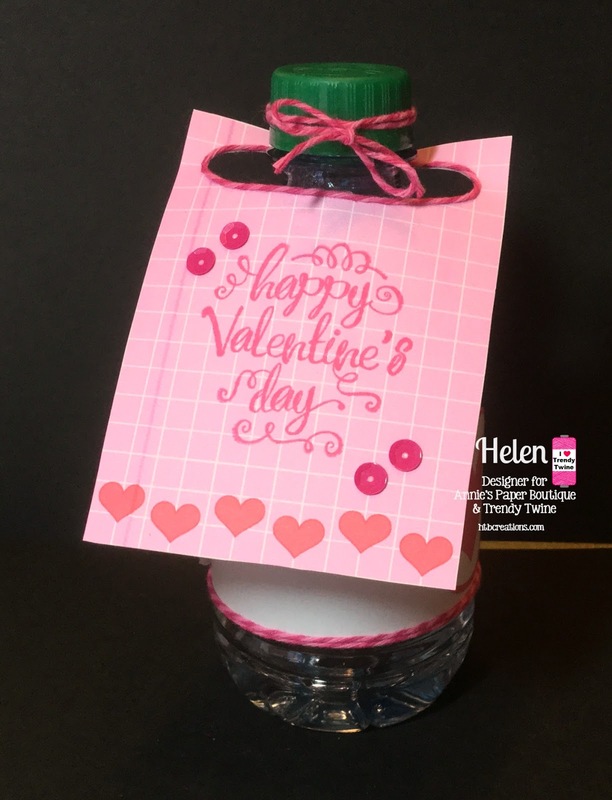 It's Millie, from Crafting with Creative M, and today I have for you a Valentine's Day treat with the pretty Raspberry Cupcake Trendy Twine along with the coordinating Raspberry Cupcake Sequins. I decorated a Small Kraft Gable Box with DCVW's "The Blossom Song" stack. For the front of my Valentine's Day treat I adhered the I (heart) You caption. I then ran the rectangular hearts die cut through my Xyron sticker machine and wrapped some of the Raspberry Cupcake Twine to the center of each heart. I then added a few Raspberry Cupcake Sequins and a sticker heart(top). 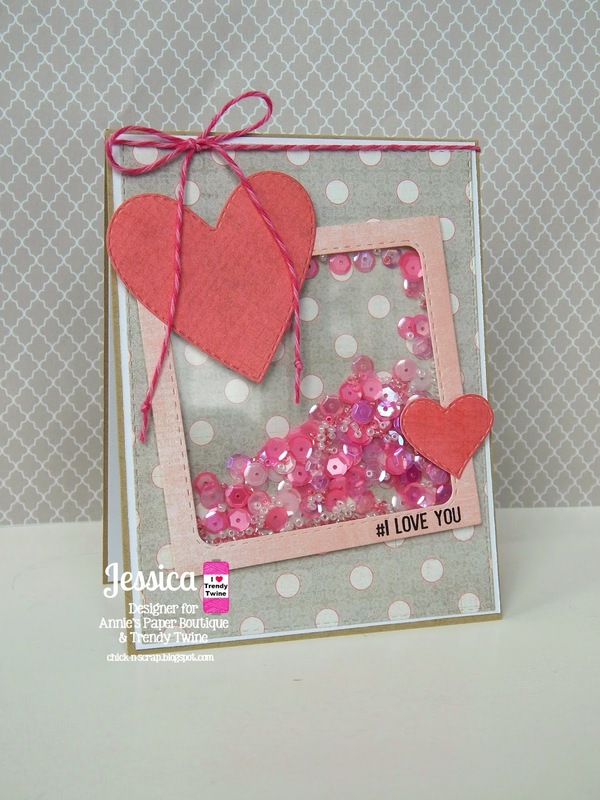 I adhered the die cut hearts and the "Be my Valentine" caption. I then sprinkled some of the Raspberry Cupcake Sequins for some sparkle. I tied a piece of Raspberry Cupcake Twine to each end and placed pretty pink pearls. I will be adding some chocolate goodies later on. I ran the scallop heart circle through my Xyron sticker machine and then wrapped some of the Raspberry Cupcake Twine to the center of the heart. 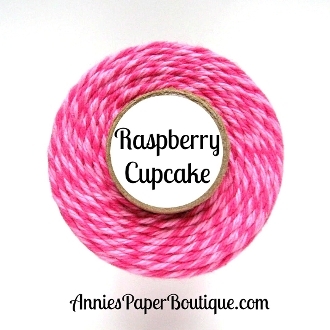 Raspberry Cupcake Twine and Raspberry Cupcake Sequins. 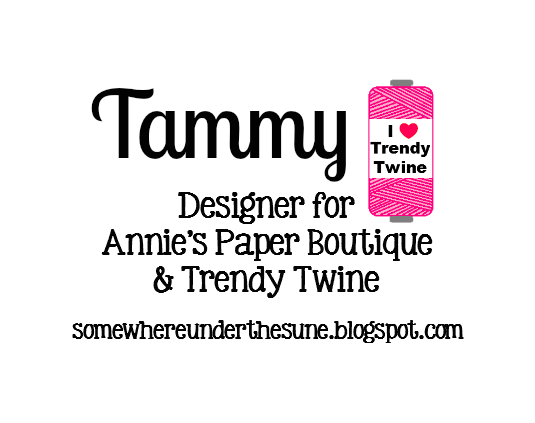 Shakers are so fun to make a very easy to do...especially with the new sequins available from Trendy Twine. I love that Lesley is making mixes that match her twine colors!! Can't wait to see what new mixes she has in the works! To make my shaker, I used a designer paper from My Minds Eye and stamps and dies from My Creative Time. I used the selfie frame and added the gorgeous Raspberry Cupcake sequins to the inside. I also had some white and matching pink seed beads that I added as well. I finished my card off with a big Raspberry Cupcake Trendy Twine bow. Trendy Twine - You Sparkle!